Ever wonder what’s going on at the bottom of your fridge drawer? You know, where the flimsy carrots and celery hang out? Mine is a mess. Always. And for some reason I think it’s OK to keep jamming stuff in there until the drawer dislodges from the hinge (those things are junk anyway). Then, on the rare occasion that I’m feeling particularly inspired, I clean said drawer. Oh look… ginger! A sweet potato! A cheese stick! Mold! It should have its own zip code. Lucky for you, none of those things are in this recipe. I did however, find some parsley lurking about. Unlike cilantro, basil and other delicate herbs, parsley is a little more hearty. And when stored properly it will last about 1-2 weeks. I usually score a huge bunch for about $.99 year round. That’s way cheaper than those little plastic packs of herbs. In the spring and summer, I look forward to growing my own herbs (and so do the rabbits). Both methods work. It just depends on how much room is in your fridge and where you want to put it. It’s not just a garnish! Poor thing- only used as a finishing touch to impart that ‘obligatory’ pop of green. But when featured as an ingredient it tastes fantastic. So, after rummaging through the fridge like a gopher, I made this simple dinner. The inspiration comes from the traditional Italian dish, Aglio e Olio. It’s a basic pasta made with olive oil, lots of garlic, parsley and anchovies (oh, stop… you love anchovies). I didn’t have any so you’re in luck this time. For the pasta, I chose fresh fettuccine. Every ingredient counts when making simple meals, so think quality. That’s not to say I’m against dried pasta. But fresh pasta is special. So special in fact, having it mid-week seems luxurious. It’s usually a restaurant thing for me. It cooks in about 3 minutes too! I had just enough time to run upstairs and change into my comfy pants before digging in. And finally, to finish: artisan salami. It was buried underneath the parsley. I found one of those logs originally destined for a cheese plate, but instead, I sliced and scattered some over the top for a touch of salty flavor. If I had to do it again, I would use a good-quality deli salami. Sliced paper thin. It’s more complimentary to the thickness of the pasta. 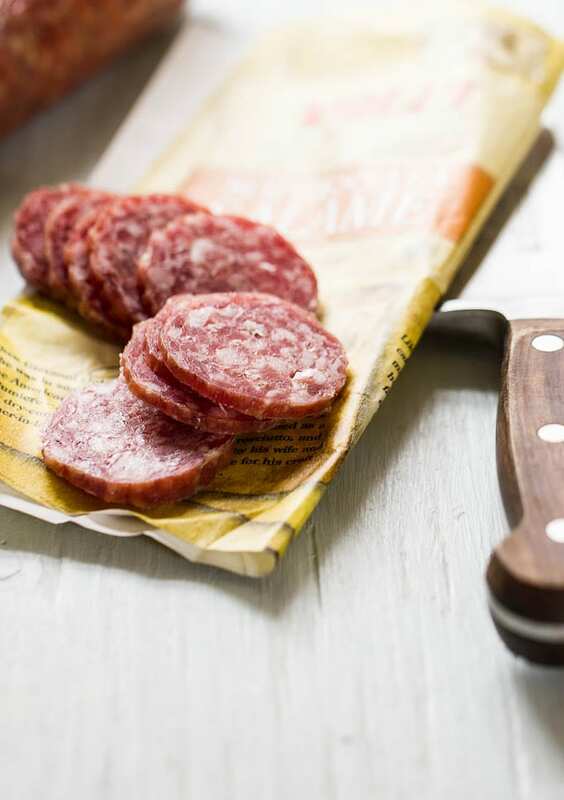 And of course, you could easily swap the salami for pancetta or bacon too. Super simple. That’s how I like to eat. What do you like to cook during the week? * Kitchen Notes: Substitute with pancetta or bacon if not using salami. Give it a quick sauté, about 5-7 minutes or until lightly golden. And the olive oil and garlic, then proceed with the rest of the recipe. Bring a large pot of water to a boil. Add a pinch salt and cook the pasta according to the package instructions. Reserve a small mug of pasta water before you drain it; you'll use it for the sauce. Meanwhile, warm the olive oil over medium-low heat. Add the garlic and stir until fragrant, about 30 seconds - 1 minute or so. You're looking for the garlic to be soft and tender, not brown. It will taste bitter. Remove from the heat. At this point, your pasta should be perfectly aldente. Go ahead and add it to the warm olive oil and garlic. If your skillet is too small to accommodate the pasta add the everything back to the empty pasta pot. Add a splash of the reserved pasta water. The key here is to keep mixing until the sauce becomes slightly thickened. Add more olive oil if necessary. To serve, sprinkle the salami over each portion. Add parmesan cheese to taste. 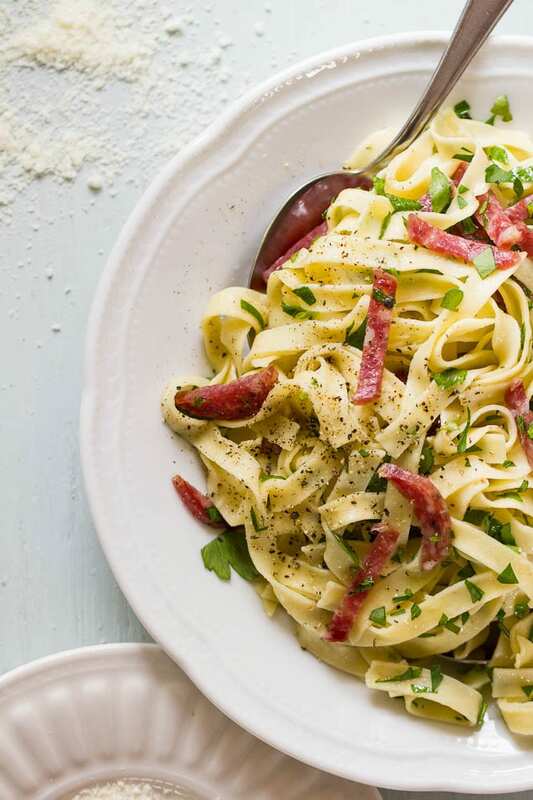 Girl a bowl of this simple pasta would make my heart sing right now. Welcome back and have a great day! So… now I have dinner for tonight! We have the already diced Pancetta in said drawer in fridge, and I’ll pick up some fresh pasta. Thank you ! P.S. My blog is down indefinitely due to terrible server issues…so don’t try going over there right now! Welcome Libby! Oh yes, pancetta would be perfect in this. You just reminded me- I keep a stash of pancetta in our freezer but when we came back from vacation, we learned that our power switched off (darn winter storms) and melted everything! The pancetta was so sad looking. I remember looking at it thinking, ugh what a loss! It’s so nice to have some on hand to quickly add to meals. I hope you enjoy your dinner! That sounds like the name of a tv show, lol. I also could eat pasta every night with anchovies, especially those little white ones. They have a delicious caesar salad at the restaurant right now (with ricotta salata!) and white anchovies… heaven! simple pasta dishes are perhaps my favorite dishes ever. if i had to choose. don’t make me choose, though. looks delicious! This is my kind of meal! Love it! Fresh pasta, I agree. And simple is better. I’d love for you to share the recipe with anchovies. This reminds me of a dish of zucchini stuffed with chopped salumi, bread crumbs, bechamel, and cheese that I had last summer in Emilia Romagna where nothing is wasted. So deliciously, deceptively simple! Simple pasta dishes are the best, I love this! 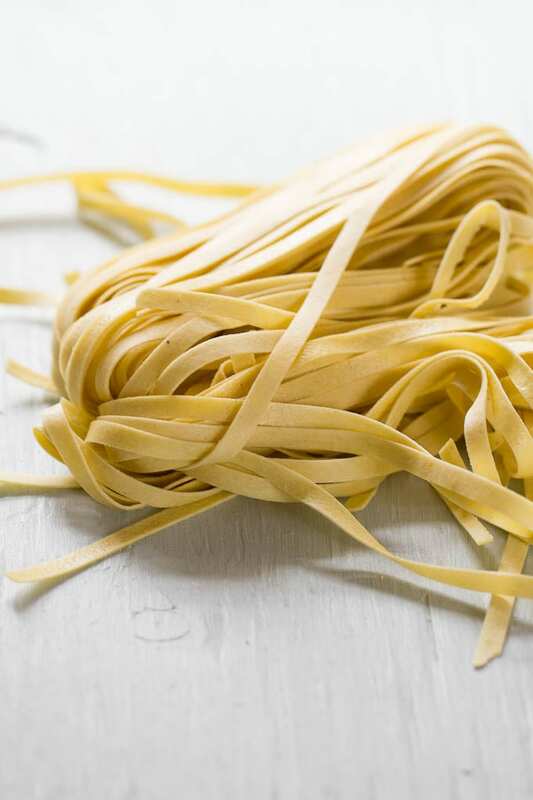 Fettuccine is my kind of comfort food… well, pasta in general, but I have a strong affinity for fettuccine. The simplicity of your recipe is perfect for my tastes, especially when I’ll need something quick. The olive oil and garlic is so classic and always crave worthy. I agree, parsley is way underrated. I almost always have a bunch in my fridge and it’s staying power is quite impressive, yes. 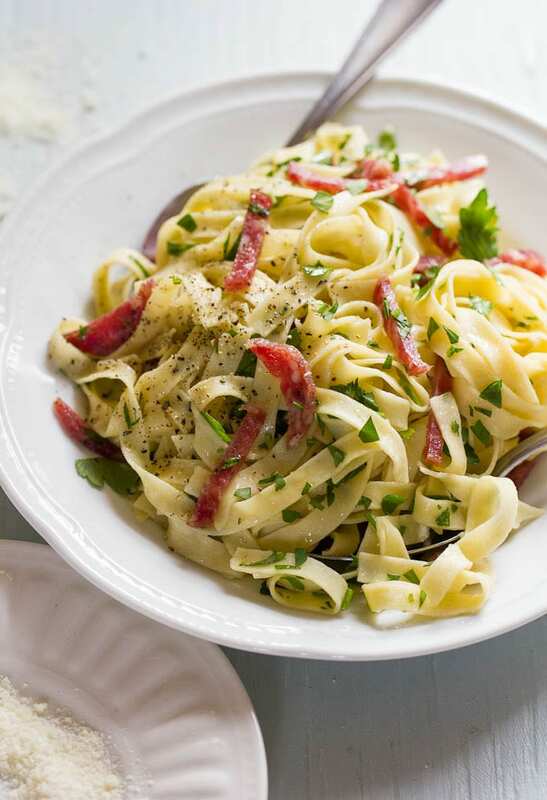 Added to this pasta, with other such simple ingredients, lets the lowly parsley shine. I love the freshness it adds to any dish and it should never, ever be used just as a garnish! We need to support parsley more! There’s always an adventure in cleaning out veggie drawers. I inevitably find a tiny nob of ginger that’s covered in mold… long forgotten because it got stuck under the bag of carrots. Welcome back Emilie! I missed you! I hope your trip with restful and adventures. Can’t wait to hear about it! PS: I pulled my first sourdough in two years out of the oven last week. Oooooh the excitement, the aroma, the flavor!! I did a country multigran and pushed the hydration because, well, I love the crumb! Thank you for your inspiration!!! Me too! I think there’s something extra special about its shape… I’m not a picky eater at all but I’m very particular about my pasta. The shape and texture always takes center stage and the rest of the ingredients follow. It’s such shame to see so many recipes ‘swimming’ in sauce, don’t you agree? This is a perfect example of how easy cooking can be. It’s a simple and delicious meal that anyone is capable of making on any busy day. Thanks for the inspiration! I love a nice salami and parsley is definitely an underrated herb! Let’s bring it back! I totally agree with you about parsley being under rated. It is a delicious and super healthy ingredient. I love adding big bunches of chopped parsley to my pasta and salad dishes and even to pestos and of course taboulleh. If you like, check out a few of the ways I use parsley as an ingredient http://sweetgreenkitchen.com/tag/parsley/. Thanks, your recipe looks lovely! I love that this is so easy to make! I’d have to recreate this dish one of these days. Beautiful photos! Always loved pasta. Thanks for this great and simple recipe! Nice photos btw. Hi there! Thank you! This meal is super simple and quick. I hope you enjoy!